Wishbone Day: Wishbone Day - about changing perceptions! My name is Brianna Hartmann. I have OI and I am also a pre-med student. What does Wishbone Day mean to me? 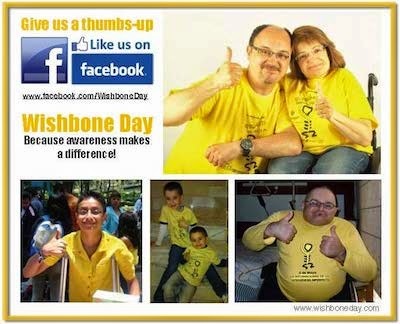 To me, Wishbone Day is about changing people's perceptions of people with OI as well as raising awareness. I have spoken to many conferences of physical therapists, occupational therapists, doctors, medical students etc, about my experiences with OI. I do this to raise awareness within my medical community and colleagues and also to show that sometimes perceptions of living with a medical condition isn't always right. I have been a cheerleader, in a marching band, part of a science team and much more. I want people to know that people with OI can do anything they choose! Wishbone Day is another way to get my message out there - people with OI are not limited. Awareness really does make a difference! And I'm looking forward to 6 May 2013 next year!